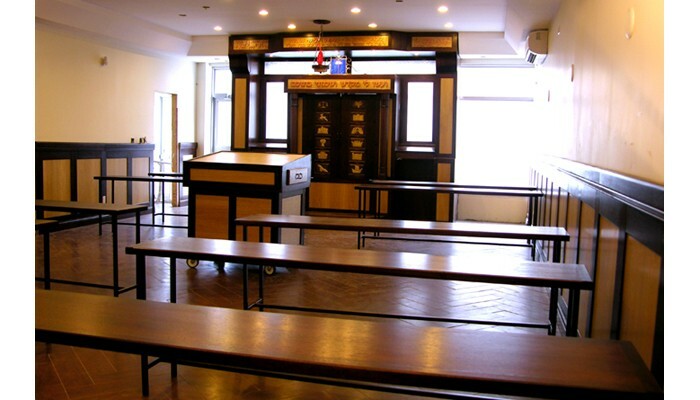 Bass Synagogue Furniture was commissioned to design consult and produce all the furnishing and interior for this newly built yeshiva in Toronto, Canada. 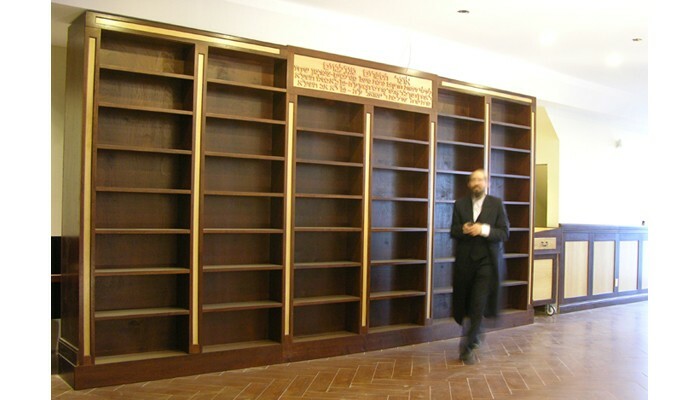 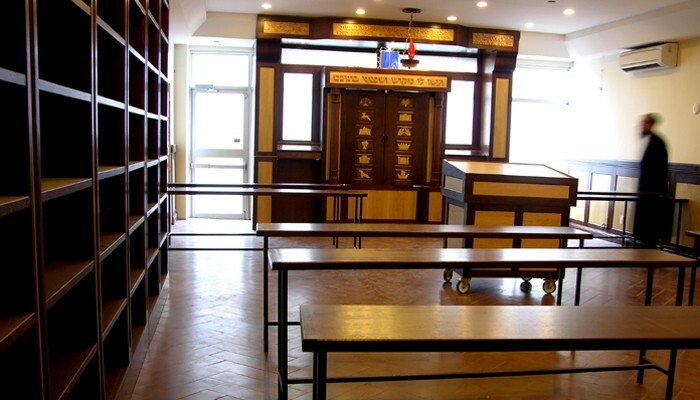 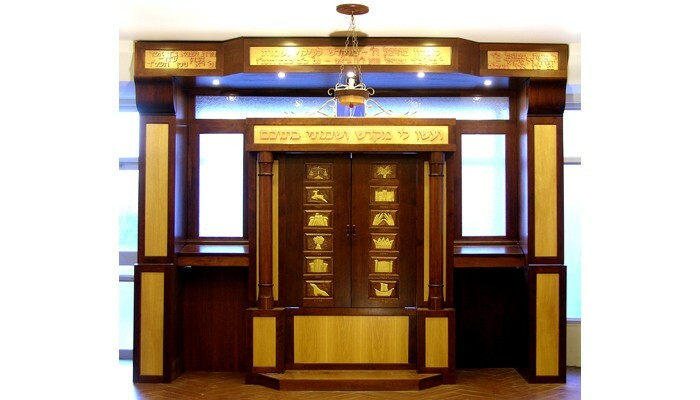 Built in a Chasidic style, the project includes the Aron Kodesh, Bimah, ner tamid, sixty-four feet of wainscoting, nineteen book shelves framed by pilasters and dedication plaques, nineteen tables, fifty desk top shtenders, and two bulletin boards. 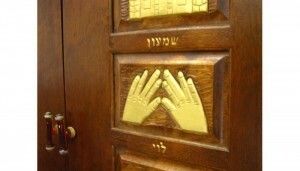 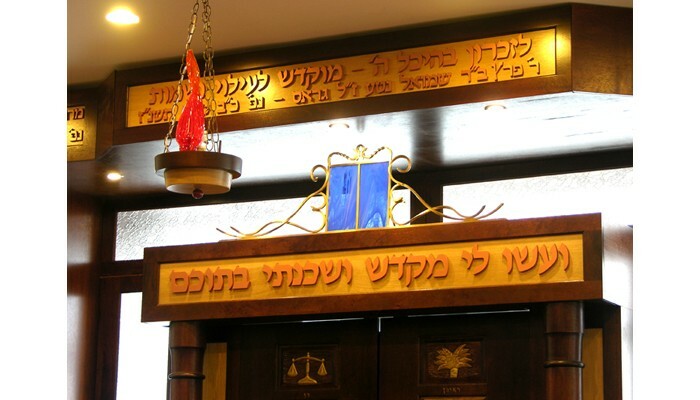 The Aron HaKodesh doors are uniquely hand carved and guilded to represent the twelve tribes of Israel. 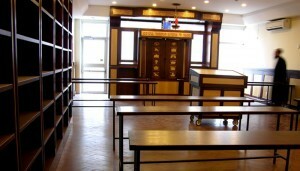 The columns were hand lathed in the studio. The crown above the doors was produced from brass with inlaid art glass to represent the ten commandments. Two shtenders are built into either side for the rabbi and cantor. 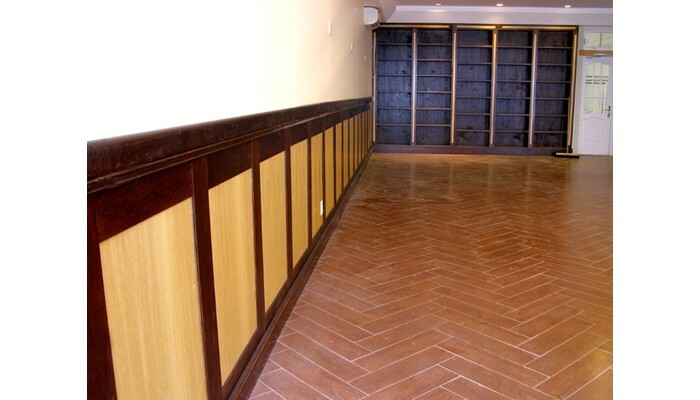 Wainscoting was designed in solid wood framework with deep molding, all made by hand in the studio to match the rest of the work. 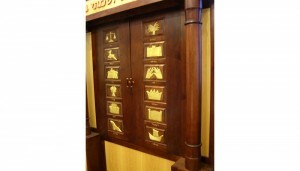 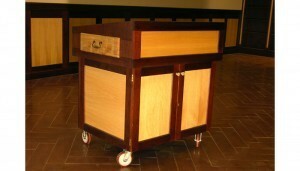 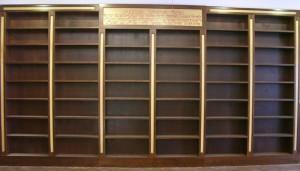 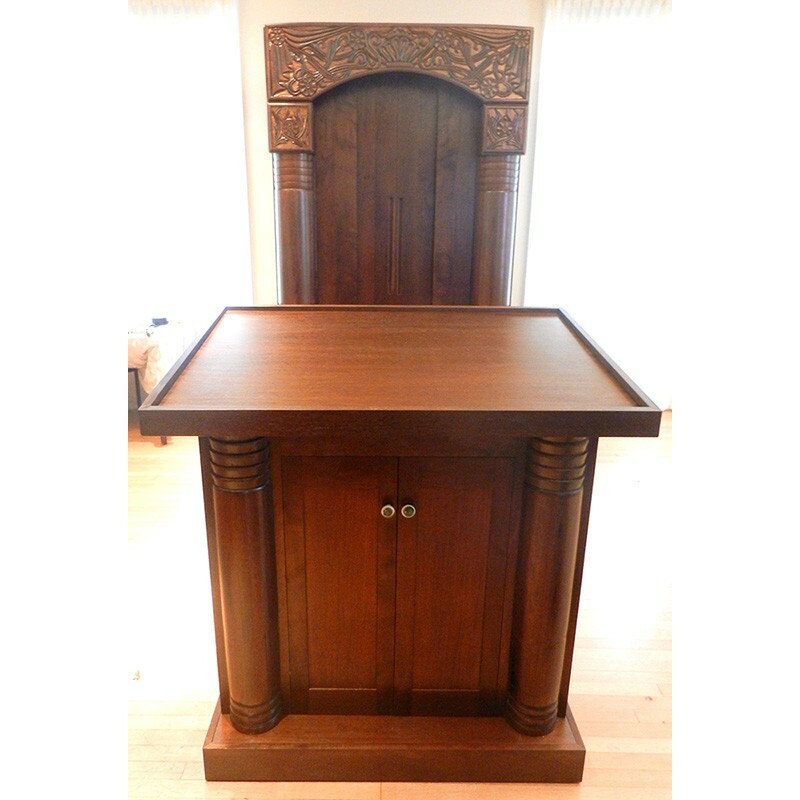 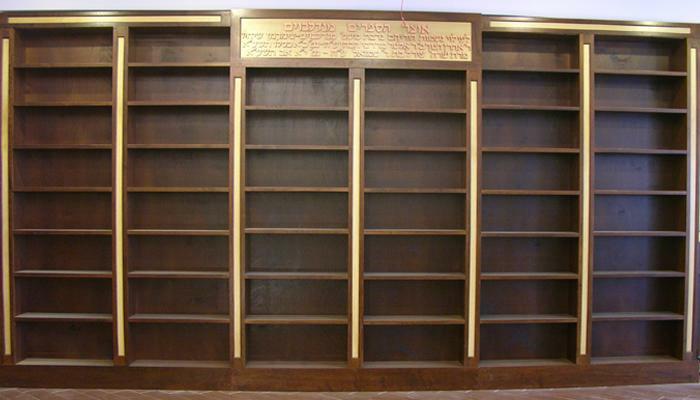 The Bimah features a solid wood drawer which opens with a cover for the gabbai to follow the torah reading. The Ner Tamid feature hand blown glass flames and hangs in front of the Torah Ark. Bass Furniture designed and built this yeshiva interior according to the needs, style, and budget. We built, shipped, and installed three tons of matching interior carpentry in two-tone, stained and unstained African Walnut. Before production we render the entire interior design according for the space, including all the proposed furnishings. 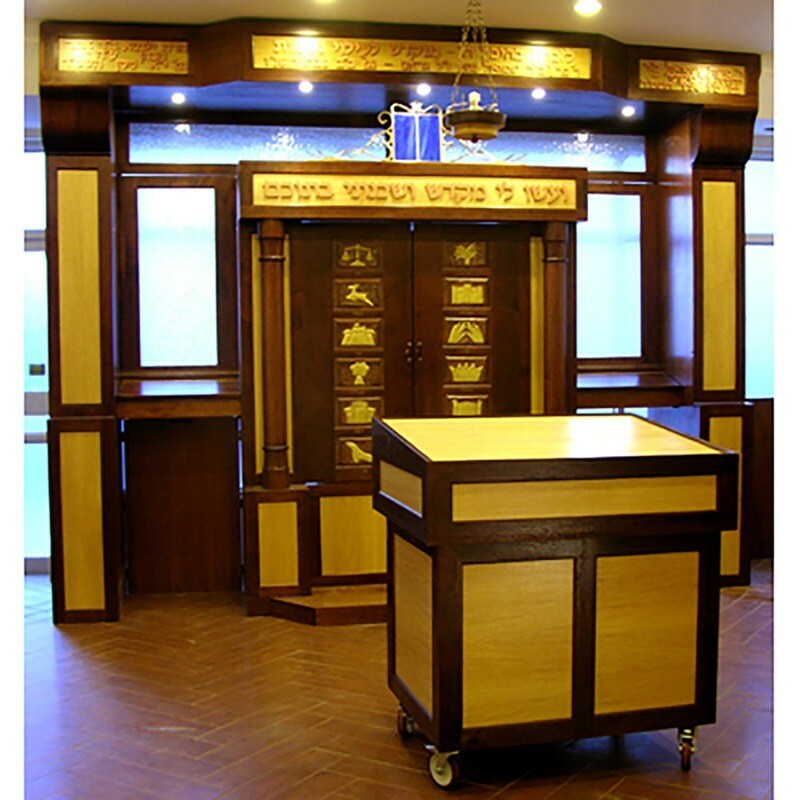 The detailed design helps the synagogue donors and committee to actualize the project. 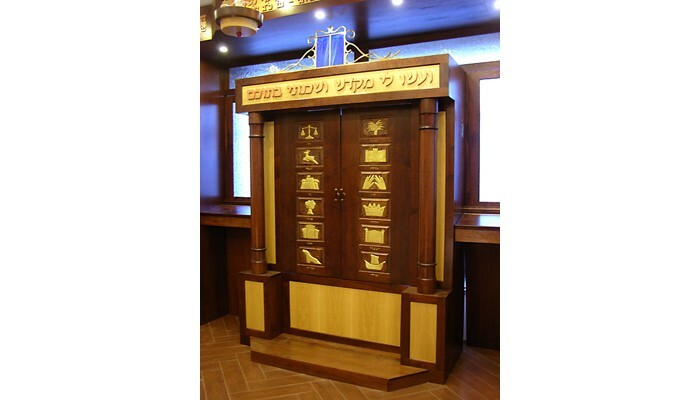 Please contact us for information on how to design and produce a synagogue interior and torah ark to suit your congregation, either in a similar or different style. At Bass Synagogue Furniture we offer only the highest grade materials, finest craftsmanship and best service of any synagogue furniture makers anywhere. 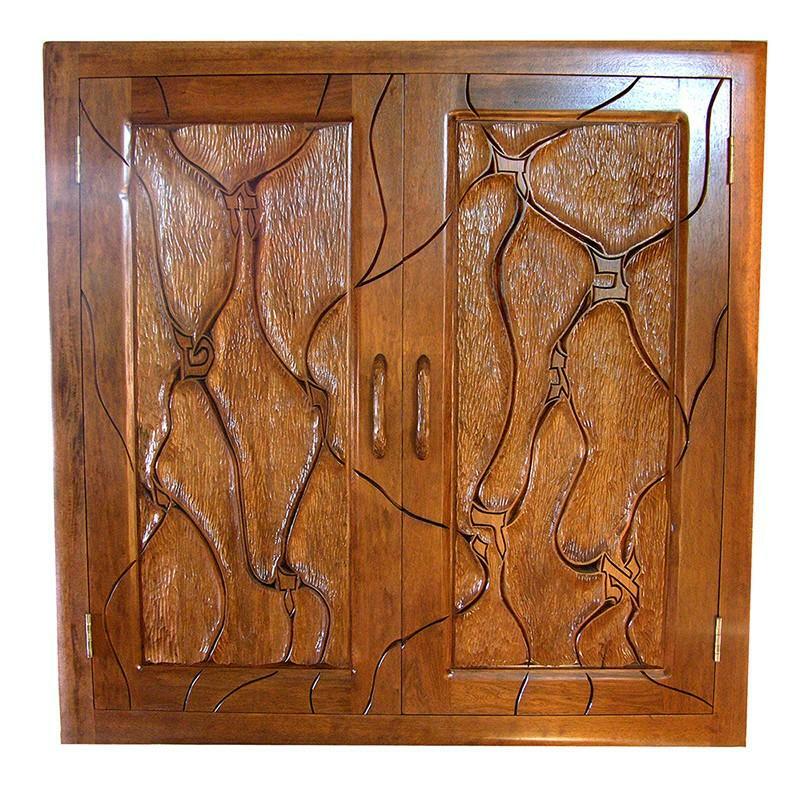 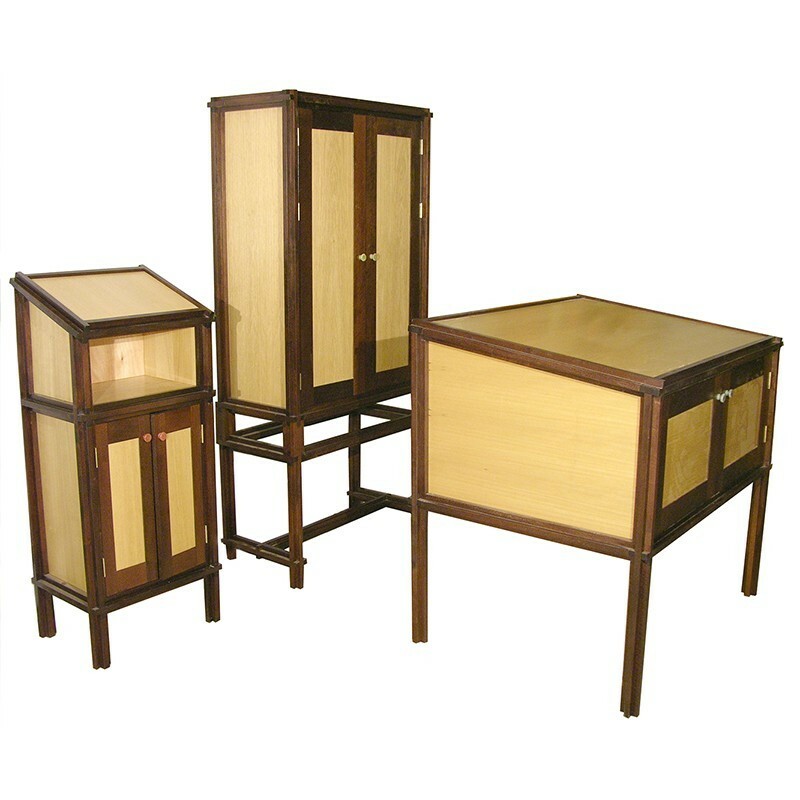 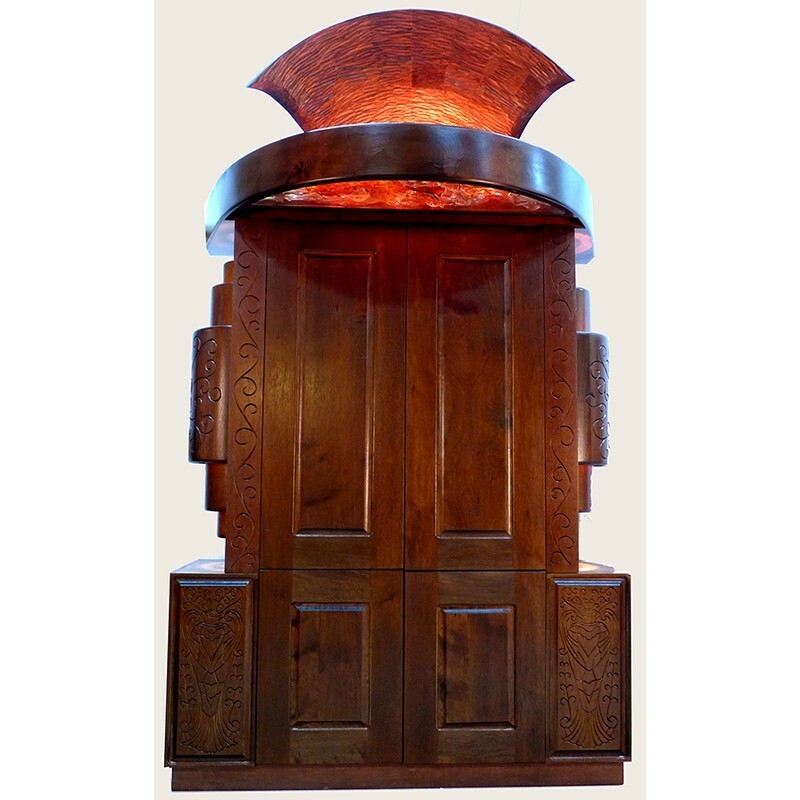 We offer your choice of wood color, unique detail work in carving and glass. 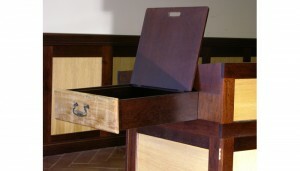 Let us take care of everything, from design through installation.